This is a plugin that allows for quick and easy lens distortion correction or effects including chromatic aberration. When working on tracking or composition CG elements with shot footage, you usually have to deal with lens distortion. At first you would undistort your footage in your matchmove or compositing package, then track it, render your CG and make sure to apply the same distortion to your CG so it will look and match perfectly! While this methos workd, it makes you go back and forth with your different applications to undistort, distort again and so on! 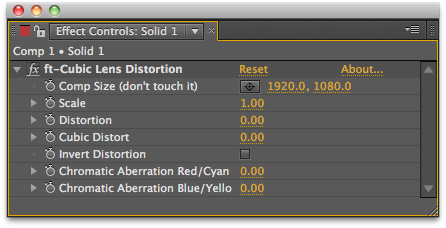 ft-Cubic Lens Distortion let you manage all those distortion steps in one place: After Effects. It is based on the Syntheyes cubic lens distortion algorithm! You will be able to un-distort your live footage, and distort your CG renders without going back to Syntheyes (or any other app you are using for lens distortion)! On top of that, you will be able to apply finishing effects like chromatic aberration to your final composition. Bug fix with speed issue in CC 2015. It is now much faster.